The Washington Post’s Rajiv Chandrasekaran on Sunday wrote a piece on UAE’s Al-Dhafra Air Base. The vast desert airfield hosts U.S. fighter jets, which night after night for the past six weeks have taken off heading north on bombing runs over Iraq and Syria. The Pentagon does not publicly acknowledge the American presence at Al-Dhafra, but the twin-runway airfield has become a vital part of U.S.-led campaign against the Islamic State. On many nights, the U.S. planes are accompanied by a wave of F-16 Fighting Falcons operated by the UAE’s air force, Chandrasekaran reports. The UAE has indeed become America’s closest ally in the fight against ISIL. Shared concerns over the rise of militant Islam and Iran’s regional policies and nuclear program are likely to be the foundation of the growing U.S.-UAE relationship. 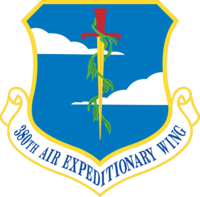 File photo: Emblem of the 380th Air Expeditionary Wing (380 AEW), attached to U.S. Air Force Central (AFCENT) stationed at Al-Dhafar Air Base, the UAE. In addition to Al Dhafra AB (ICAO: OMAM) in UAE, U.S. airpower also using Ali Al Salem AB (ICAO: OKAS) in Kuwait and Al Udeid AB in Qatar ( ICAO: OTBH). yes, should it come to a shooting war between the US and Iran, iran will have so many places to target as the US will or might fly over Iranian soil from so, so many directions.